Pye model 9014 Three band Radio cassette powered by 4 type D or HP2 cells or from a 240 volt 50Hz supply. The frequency coverage is: FM 88-108, LW 150-300kHz, MW 520-1600 KHz. This is one of two radios given to me by Mr and Mrs Williamson. Both had been residing in a cat basket in an outside shed for several years. working made in Taiwan. 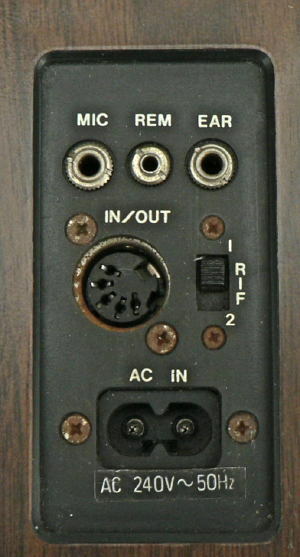 When the set is operated from the mains, switch contacts on the input socket disconnect the internal battery. However, the transformer which can be seen in the bottom left corner in the picture below can only be de-energised by removing the plug or switching off the supply at source. As received the tuning knob was missing as was the lever operating the wave change switch. 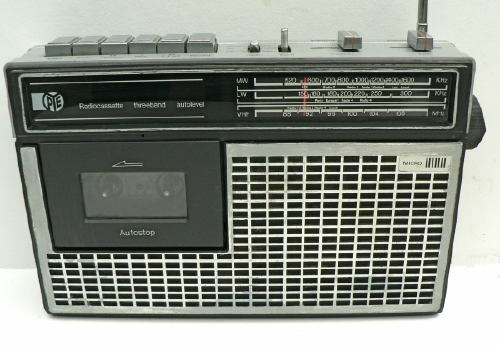 The radio produced sound when energised, though the cassette mechanism failed to operate. A replacement knob was altered to suit the tuning shaft and a screwed steel spacer was used to fashion a lever for the wave change switch. The radio is equipped with a reasonably sized speaker and works well on all three wavebands. 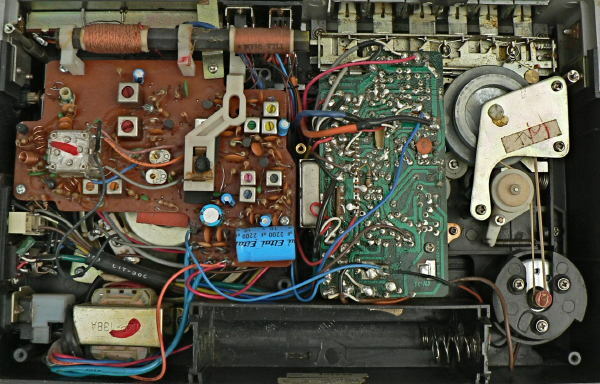 The switch contacts were sprayed with switch cleaner and when the drive belt on the cassette drive was replaced with a rubber band the mechanism operated and produced sound with considerable wow and flutter! The second drive belt needs replacing as well.